The haplogroup (clade) name is given first, followed by a list of one of more SNPs*. Some list items have more than one name, in which case the SNPs are listed together with / between the names. To find an individual's haplogroup, go to the most downstream positive (derived) SNP. To see the subclades and their SNPs, click on the haplogroup name. * SNP has become the common phrase for those markers listed after clades/subclades; see UEP and SNP in the glossary. Identical SNPs that were discovered separately are listed in alphabetical order, not necessarily in the order of discovery, and separated by "/". Examples: SRY1532.1/SRY10831.1, M1/YAP, M40/SRY4064/SRY8299, M130/RPS4Y711, M213/P137, L15/S137, L16/S138, M429/P125, M74/N12, M207/UTY2, M306/S1, and M184/USP9Y+3178. L69.1/S163.1 is shown as L69(=G) in IJK. L69/S163 appears in multiple locations. Y-DNA haplogroup descriptions are provided on each haplogroup page. The combined haplogroups are the only ones whose description appears on this page. The BT haplogroup split off from haplogroup A 55,000 years before present (bp). It probably appeared in North East Africa. The C,F haplogroup was the common ancestor of all people who migrated outside of Africa until recent times. The defining mutation occurred 31-55,000 years bp in North East Africa and is still most common in Africa today in Ethiopia and Sudan. The DE haplogroup appeared approximately 50,000 years bp in North East Africa and subsequently split into haplogroup E that spread to Europe and Africa and haplogroup D that rapidly spread along the coastline of India and Asia to North Asia. The IJ haplogroup characterizes part of the second wave of emigration from Africa that occurred via the Middle East 45,000 years bp and defines two branches I and J that emigrated northwards and eastwards into Europe. The J branch subsequently split again and contributed to the current North African population. The NO haplogroup appeared approximately 35,000-40,000 years bp in a region east of the Aral sea; subsequent branches spread to North Asia (N) and another branch (O) to South Asia via North India. Butler, Recent Developments in Y-Short Tandem Repeat and Y-Single Nucleotide Polymorphism Analysis. (pdf) Forensic Science Review, Vol. 15, No. 2, 100-111, 2003. Chandrasekar et al, YAP Insertion Signature in South Asia. Annals of Human Biology, 34(5);582-6, 2007. Charoni et al, Y Chromosome Diversity, Human Expansion, Drift, and Cultural Evolution. PNAS, 106 (48); 20174-20179, 2009. Hammer et al, Hierarchical Patterns of Global Human Y-Chromosome Diversity. (pdf) Molecular Biology and Evolution, 18:1189-1203, 2001. Hammer et al, Population Structure of Y chromosome SNP Haplogroups in the United States and Forensic Implications for Constructing Y Chromosome STR Databases. Forensic Science International, (in press), 2005. Jobling et al, The Human Y Chromosome: An Evolutionary Marker Comes of Age. Nature/Reviews/Genetics, 4:598-612, 2003. Karafet et al, Major East-West Division Underlies Y Chromosome Stratification Across Indonesia. Abstract. Molecular Biology and Evolution, doi:10.1093/molbev/msq063. 2010. Rootsi S, Human Y Chromosomal Variations in European Populations (dissertation) Council of the Institute of Molecular and Cell Biology, University of Tartu, Oct 2004. Underhill et al, The Phylogeography of Y Chromosome Binary Haplotypes and the Origins of Modern Human Populations. (pdf) Annals of Human Genetics, 65:43-62, 2001. Underhill et al, New Phylogenetic Relationships for Y-chromosome Haplogroup I: Reappraising its Phylogeography and Prehistory. in Rethinking the Human Evolution, Mellars P, Boyle K, Bar-Yosef O, Stringer C, Eds. McDonald Institute for Archaeological Research, Cambridge, UK, pp. 33-42, 2007b. Underhill et al, Use of Y Chromosome and Mitochondrial DNA Population Structure in Tracing Human Migrations. (abstract) Annual Review Genetics, 41:539-564, December 1, 2007a. Underhill et al, Y Chromosome Sequence Variation and the History of Human Populations. (pdf) Nature Genetics, 26: 358-361, November 2000. Y Chromosome Consortium (YCC), A Nomenclature System for the Tree of Human Y-Chromosomal Binary Haplogroups. Genome Research: 12:339-348, 2002. Added V45 to Haplogroup R on 12 January 2010. Added Ron Scott in Additional Resources on 13 January 2010. Added M522, M523, M526 and Charoni et al (2009) and Karafet et al (2010) on 9 April 2010. Added Page83 on 4 December 2010. 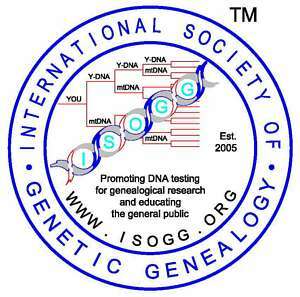 Copyright 2010 International Society of Genetic Genealogy. All Rights Reserved.